The eclipses have arrived! Some of you may already be feeling them because the eclipses can be felt a month prior to their actual arrival. They are at their most potent then and up until a month afterward, and then when hit by transiting mars, Jupiter and the other outer planets. By the way, the first hit by mars will happen the third week of January when mars is in Aquarius. This eclipse is in Scorpio. Because of that it will be intense and deep. Transformation is possible under this eclipse because of the Scorpio flavor. People may become dark and somber and depression is possible because of the extreme feelings this eclipse will impart. The chart also has a Neptune flavor to it, so it’s all very Pluto slash Neptune. Mercury is retrograde in Sagittarius (that’s a separate article) and makes a square to Neptune so there could be sadness and feeling down in the dumps. There can also be deception committed and uncovered. Whenever Neptune’s involved there’s deep feelings and also deep deception. They’re the two sides of the Neptune coin. Both mercury and Neptune answer to Jupiter, who is sitting there, bereft and weakened by sign and retrogradation, and unaspected. So it seems that deception and feeling down in the dumps will be the order of the day with this one. It could be that people look back on the past and have a lot of resentment and regrets. That also fits with the dark side of Scorpio. Rumination and brooding over the past will be easy to sink into. Crimes near eclipse time always seem to be extreme, more so than the norm. If you pay attention to the news at all, you’ll notice very bizarre stories. This time, we had a police officer in NYC who was stalking 100 women with plans of cooking them alive. Very bizarre and also very sadistic (Scorpio). This eclipse happens on Unukalhai: Also called, “Serpentis.”It is said to give wisdom, craft, deceit, malice, a feeble will and danger of poison. It has a Saturn-Mars flavor. It gives immorality, accidents, violence and danger of poison. This “poison” theme is being repeated a lot lately. If you read the Mercury Rx article, there were themes of that there as well. I think it may mean a more symbolic poisoning. Some may become unhinged during this time, with people who are predisposed to mental illness having excaberations now unless they’re careful. It can also represent poisoning in a relationship. Jealousy comes to mind. With scorpio being the sign of the eclipse, that’s to be expected because it’s the shadow side of the sign and eclipses tend to bring the shadow side out. Stalking and issues of manipulation and control can manifest. I would expect to see crimes take a more sadistic turn under this new moon. A more melodramatic flare may turn up in crimes when they’re usually pretty standard fare – the Joker Crime comes to mind since it was so over the top and unreal. In crimes is where we’d actually possibly see the literal ‘poisoning’ theme show up, so maybe there will be a spike in murders using drugs or poison. Drug busts on a grand scale are also possible. 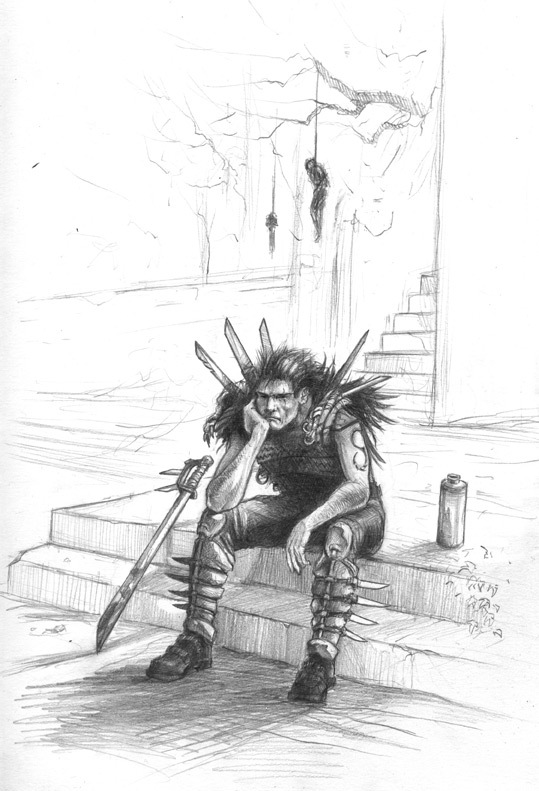 In the Neck of the Serpent (Serpens), Unukalhai shows its properties as a Martian force combined with Saturn and is often really dangerous and destructive. There will be chronic diseases, which are not easily detected, these will result in a weakened state of health and operations will be necessary. There will be accidents. I hope this doesn’t point to some sort of major act of terrorism somwhere. The mars-saturn and scorpio theme is right up that alley. On a more mundane level, we may see more drug deaths, alcohol related deaths, and even some gas type issues, like gas explosions or poisonings from gases. On a more positive spin (this article has been dark and depressing so far) there could be a new drug developed that’s very beneficial. We can also see healing under the scorpio eclipse on this degree. The light side of ‘poison’ is healing. So maybe a breakthrough in medicine is near. A breakthrough in personal lives is also possible. Scorpio is about breaking down to rebuild. It may get darker before it gets lighter, but maybe that’s what some people need. There’s a story behind Serpentis that may provide clues. When Glaucus, son of Minos, King of Crete, was drowned in a barrel of red honey, Aesculapius was sent for to restore him to life and was shut in a secret chamber with the body. While he stood wondering what to do a serpent entered, which he slew. Thereupon another serpent came in bearing a herb which it placed on the head of the dead serpent, thereby restoring it to life, and Aesculapius, using the same herb, succeeded in restoring Glaucus. 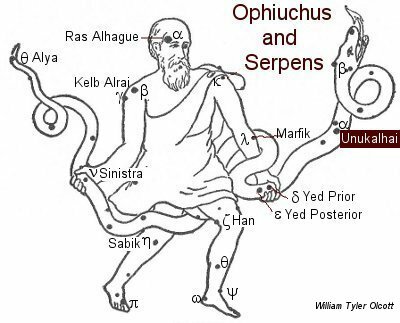 The serpent (Serpens) was placed in heaven and for this reason certain writers have identified Ophiuchus with Aesculapius. This story shows that a domino effect situation may occur that ultimately provides the answer that is needed. The doctor had to figure out how to resurrect a dead child, which is a huge crisis, when he’s presented with another crisis – a serpent shows up while he’s literally trying to raise the dead. So he kills it. In doing so, he caused another serpent to appear (the first serpent’s friend or kin?) who rose above his natural desire to kill the doctor or to exact revenge because he needed the doctor to save his fellow serpent. He provided the means to do just that, and the doctor was not only able to resurrect the serpent, but was also able to do so to the child. All were saved. By a series of events and teamwork and sacrifice all was well in the world there. So, this eclipse can show a merging of two, who truly don’t like one another, but find they need each other for their own interests. It’s the ultimate parable of diplomacy, negotiation and peace. Therefore, there can be interesting alliances now because of a domino effect, and the result being beneficial for all involved. It shows healing on every type of level, medically and otherwise. So maybe some great health discovery will come about from some awful catastrophe. Or two people or countries will pair up to benefit themselves by putting there mutual dislike aside. This shows a theme of healing and also taking the high road. Making lemonade out of lemons. It also highlights medicine, herbs, drugs, doctors, healing and conflict resolution. 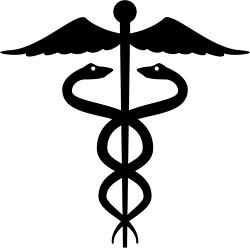 The Rod of Aesculapius, a snake-entwined staff, remains a symbol of medicine today. Something will happen with medicine and the medical field related to this eclipse, but I don’t know exactly what. It could be something to do with Obama’s healthcare plan. Will there be some sort of major compromise now like in the story? This eclipse will be activated when planets from mars outward aspect it. The first one to hit will be mars. Then we’ll have saturn hit it later. Stay tuned because I usually post that on my twitter or facebook, but I do try to post it here too. This entry was posted in Eclipses and tagged 21 scorpio, new moon scorpio, november eclipse, scorpio eclipse, serpentis. Bookmark the permalink. Homeopathic treatments come to mind- intensifying symptoms i.e. the healing crisis is the cure. Alchemy and homeopathy rely on mindfulness and intent to induce cure or chaos. In Healing Beyond Reason, Carolyn Myss explores The Dark Night of the Soul and simultaneous cures through complete and utter forgiveness. Neptune in Pisces speaks to purifying the poisons of pettiness with the waters of life- The Holy Grail. Our hope for renewal lies in release and transcending our individual angst and creating new community. Namaste!! That’s an interesting take on it. Thank you for your insight!